Small business owners used to have only two options when creating a logo to represent their business identity and brand. They could spend thousands of dollars on professional designers, or they could roll up their shirt sleeves and attempt to create a design their own. While the second option could save money, it also ran the risk of creating an ugly and cheap-looking logo. Fortunately, times have changed, and several free and low-cost logo maker tools are now available to small business owners. What is the theme or mood of your business? Remember that your logo will represent your brand so it should fit with the image you're trying to create. What feeling do you want to project? Your brand logo represents an experience your customers will have. When they see your logo, it should evoke a positive feeling. What is your color scheme and font? You should retain a consistent color, as well as font, across all your business materials. What images or ideas will project all of the above? Many logos have images that represent an idea or concept. Check out these logo tools to help you design a professional logo to represent your business and your brand. DesignEvo is a newer logo maker on the scene that offers both a free and low cost logo design tool. 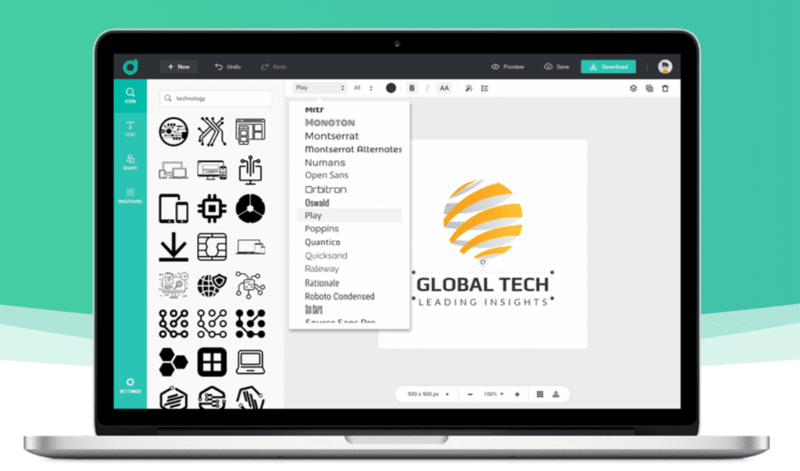 Simply choose from one of over 5,000 templates, customize it with your font, colors and more, and save. Unlike some of the other logo makers, you can download your design for free, however, it will be a low-resolution image. Or you have the option to buy a high-resolution image with transparent background for $19.95 or high quality images with copyright-free, vector and SVG files for $39.95. Logo Maker's free logo maker tool offers some great non-clip-arty images available along with many editing and customization options. Select from one of its 10,000 templates, customize it to your brand, and then save. Logo Maker lets you use the logo for free on your website by providing you with an HTML code to put on your website. If you'd like to have the logo on other non-digital materials such as your business card, you can buy and download a high-resolution version of it in JPEG, PNG, EPS, or GIF for $39.95. Free Logo Services is a bit of misnomer. Yes, you can create your logo and other items that use a logo such as business cards, banners and more. However, when you create a logo you like and want to use, you have to pay $39.95 for it. Still, the tool is easy to use. Simply enter your logo text, choose from one of thousands of designs, customize the logo with your colors and layout, and save your file. Logo Ease is a bit different from other logo makers in that it isn't a do-it-yourself tool. Instead it will have professional designers create 3 logos based on your business story. If you like one of them, you can then buy complete ownership and copyright for $199. Cool Text isn't so much a logo creator as it is a way to generate interesting looking text that can be used as or part of a logo. It renders a text-based logo in various fonts or sizes without any illustrations. Their service is completely free, but your options are limited. Take care with your selections so your logo doesn't look cheap. Zillion Designs (formally Mycroburst) isn't exactly a logo maker tool, but instead an online community of designers. The site allows you to present the design product you need -- your logo -- and list how much you're willing to pay a designer to complete the project (as low as $199 according to the website). Your listing is called a "contest" and designers compete to win and earn the "prize money." It also charges a $39 (20% of prize amount)fee to use the service. Designers that are interested in your project will then submit different draft options for you to consider. You select the winning designer and pay him your prize money. It's a great way to get in touch with many different freelance designers without having to use an expensive agency. Turnaround time is typically seven days from start to finish.